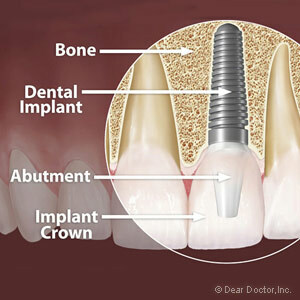 Implants have come a long way since their introduction over thirty years ago. Besides a greater array of tooth sizes and shapes to match any situation, it’s now possible to have life-like crowns affixed immediately after implant surgery when multiple teeth are missing, popularly known as same-day tooth replacement. Although innovative, immediate tooth replacement isn’t advisable for every situation, especially for individual back teeth with their higher bite forces. It’s also an intricate process that calls for careful attention at several junctures beginning with the removal of the existing tooth or root. During removal we must be careful not to damage the bone socket, the receptor site for the titanium implant. Any damage could ultimately result in gum recession and a less than attractive result. The implant must then be placed in as stable and immobile a position as possible. In time, bone will grow and adhere to the implant to add further stability. There are also important details when affixing the crown in a same-day replacement. It’s critical that the crown appears to emerge from the gums as natural teeth do. While much of this depends on how precisely the metal implant is placed in the bone socket, we can also adjust the angle of the crown’s attachment to the abutment on the top of the implant. Although life-like and smile enhancing, a same-day crown is actually temporary. The implant still requires full integration with the bone to be completely stable. To reduce the amount of biting force and protect the implant against damage during this period, the temporary crown is sized so that it doesn’t contact the biting surfaces of its counterpart on the other jaw. For full arch immediate tooth replacement, enough implants are joined together so the teeth can receive functional forces. After integration is complete, the temporary crown or bridgework is replaced by a full-sized permanent restoration. Contrary to popular perception, same-day replacements aren’t performed on the fly — they take time and care, and your missing tooth must conform to certain criteria for a successful outcome. But if done properly, it’s quite possible to leave the dentist’s chair the same day with a transformed smile.